Aromatic sulfonic acids are produced in large scale plants and are used as surfactants. Naphthalenedisulfonic acids are important intermediate substances for the production of azo dyes (see Section 9.5). Most can only be biodegraded with great difficulty and naphthalene-1,5-disulfonic acid is not biodegradable at all (Krull and Hempel 1994). Only after chemical oxidation with ozone can mineralization by a subsequent aerobic biological treatment be successful (Breithaupt et al. 2003). C10H8 + 2SO3 -► C10H8O6S2 disulfonic acid. Some fundamental microbiological studies were published by Nortemann and Knackmus (1988) and some important biotechnological research by Krull et al. (1991). The following example is discussed in detail by Christ (1999). During the technical synthesis of a desired naphthalenedisulfonic acid (i.e. 4-8-NDSA; Fig. 13.4), temperature, concentration of H2SO4 and SO3 as well as mean retention time are optimized to obtain the target product at a concentration as high as possible. 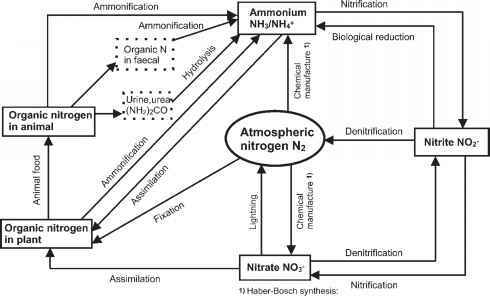 Nevertheless, some other undesired derivates of NDSA are formed and increase the wastewater load after separation of the desired product. This process is presented by Fig. 13.5a. Naphthalene is treated with H2SO4 and SO3 at 50-60°C. After addition of NaOH and Na2SO4, NSA precipitates as a sodium salt and can be filtered out. Fig. 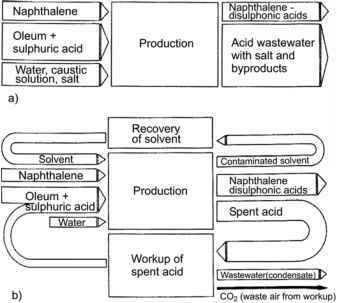 13.5 Bayer AG processes for naphthalenedisulfonic acid production: (a) old process (before 1989, 3000 t a-1 COD); (b) new process (after 1989, 3 t a-1 COD; Christ 1999). remained in the filtrate and increased the COD load of the wastewater remarkably, to levels of 3000 t a-1 COD. Only a small amount of this COD could be mineralized in the biological end-of-pipe treatment plant. A modification of the process was absolutely necessary. The first step for developing a new process was to find a catalyst with a higher selectivity in favor of the product 4-8-DNSA (Bueb et al. 1990). A team from Bayer AG succeeded by replacing the formerly used iron chloride-sulfur catalyst with an iron chloride catalyst. The result was the production of fewer byproducts. But the use of this new catalyst was only possible if sulphuric acid was no longer used as the reaction medium. The new solvent for naphthalene and SO3, a chlorinated hydrocarbon, allowed a reduction of the reaction temperature. The dehydrating action of SO3 led to the formation of higher molecular structures. The anhydride bridges must be hydrolyzed in the next step by adding the reaction mixture to water. This results in an aqueous sulfonic acid solution, the organic solvent can be separated, and the free sulfuric acid is precipitated by addition of sulfonic acid followed by cooling. After filtration of the precipitated product, the remaining "mother liquor" is regenerated as spent sulfuric acid and recycled. • Inorganic salts for the salting out of the product with subsequent filtration, resuspension and spray drying. • The portion of the desired product is increased by using a new catalyst with a higher selectivity. • An organic solvent for naphthalene and SO3 replaces the sulfonic acid which can be regenerated and recycled. • A portion of the acid used is cleaned by distillation and recycled. • The salting-out is replaced by a membrane, yielding a dye-free permeate and a concentrate which is spray-dried. The permeate can be reused as feed water; and its COD is reduced about 80% in comparison to the filtrate of the former process. The condensed vapor of this distillation process is the only wastewater, with a COD load of only 3 t a-1. The costs of production are reduced because of the reduced costs for wastewater treatment; and the yield and product quality are somewhat higher than before.